It's Writing Wednesday. Heard of the Amelia Bloomer Project? It is an offshoot of the American Library Association, through its Feminist Task Force. Since 2002 it has been highlighting "exemplary books for girls and young women that celebrate their strengths and nourish their potential" through its annual list. The books "show girls and women-past and present, real and fictional-breaking stereotypes to follow their dreams and pursue their goals, challenging cultural and familial stereotypes to gain an education, taking charge and making plans for community, regional, national, and world change." See the list here. 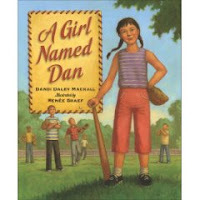 Below is a video about one of this year's books, A Girl Named Dan. The books we write can potentially have a powerful effect on the child who reads them by shaping her view of the world and her place in it.